August | 2016 | Lamb on a bike! I’d had my eye on the Monster series of races for a while. 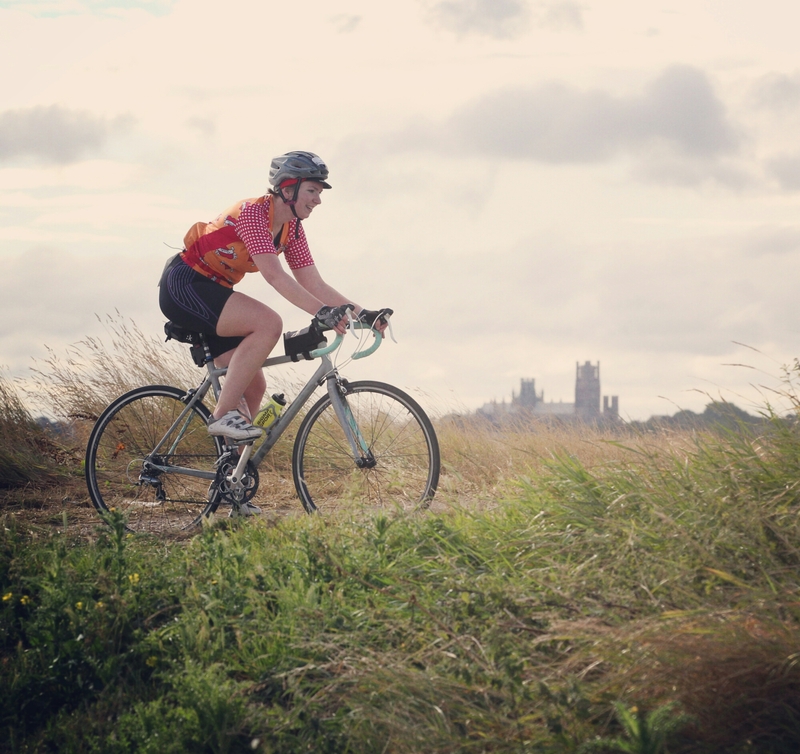 They’re based in Ely so when I was living in Cambridge it seemed ideal, and even now I live in London, it’s nice to race somewhere that is familiar, and I can combine it with visiting my parents. Last year I did sprint, olympic and middle distance triathlons. So far this year I’ve done a few running races (including 5 half marathons) but no triathlons, so I jumped straight into a middle distance. Was this to be a big mistake?! At 04:45 my mum very kindly drove me to Ely, where it was dark and rainy. I registered and stuck the requisite stickers on my bike and helmet, then said goodbye to mum and went into transition. 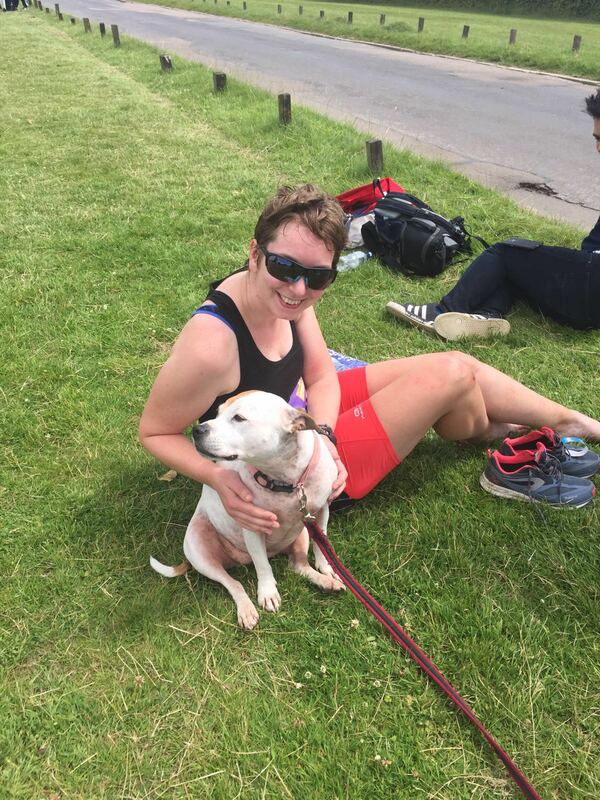 Once I’d laid out my stuff I wriggled half into my wetsuit and queued for the loos, feeling nervous, then walked to the swim start, about a mile downstream. On the walk I got chatting to a man doing his 59th race. He was super inspirational and good conversation, which helped take my mind off my nerves. We chatted to his club mates and another random they’d picked up along the way, a young guy who’d signed up the night before. Briefing done, the first wave (inc. me!) were told to get into the water, which wasn’t as cold as I thought it would be. Although I’m not a terrible swimmer, I’m not confident in open water swims, and I’m also not at all well-trained. This year I have swum five times: 1) with a sprained ankle, just before the marathon, 2) the day after that, 3) one 1km swim a few weeks ago, 4) at a spa with my mum, where I mainly did handstands, and 5) at the lido last week but I decided it was a bit chilly and didn’t stay in long. I therefore didn’t have high hopes, and when the swim got underway I felt the beginnings of panic. But amazingly, I was able to ignore it! I swam along and felt quite relaxed. I focused on breathing, although I did a lot of breaststroke (my front crawl sighting is pretty bad) swimming towards town. I have no concept of time when swimming, but knew that the second wave were starting ten minutes behind, so tried to work out when I might get overtaken, hoping that it wouldn’t be until near-ish town. I enjoyed the cheers of people on the river bank and watched a family of swans swimming imperiously through the wetsuit-clad swimmers. People on boats were watching – it must have been surreal for them. The course went upstream for 1.5km, past the exit, around a buoy and back 400m. By this point I was looking forward to getting out, and although I’d been kicked a few times, I was still calm and happy that I had survived the swim. At the exit, I reached up a hand and a man pulled me out. I then staggered about a bit and another man caught me, and then another, with me ricocheting around the slipway like a pinball, trying to shake the water out of my ears. There was a walk back to transition from the swim exit and I struggled to get my wetsuit off my arms. Once I had it down to my waist I jogged to transition and then struggled to get the stupid wetsuit off my legs. I chucked it on top of my bag (containing my post-race dry clothes, doh) and toweled myself down. Garmin on, jersey, hat, helmet, gloves, shoes, glug of water and off I went. Somehow this took four minutes? I definitely didn’t feel like I was rushing, maybe I should have been. I’m more of a cyclist than a swimmer or runner, and normally, the bike is the thing I don’t worry about in a triathlon. But I was worried about this one. I’ve not ridden my bike much this year – two days in Wales (less than 100km each day), a ride from Bath to Andover, and two trips to Regent’s Park, where I was shocked to discover how slow I am. I have been finding cycling nerve wracking of late, something I’m yet to get to the bottom of. The forecast was for strong wind – 15-18 mph – and this was correct. We cycled north with massive crosswinds, then west directly into the wind, south with crosswinds from the other side, and then finally a tailwind for the final stretch (the course wasn’t a perfect square so this bit was, of course, the shortest bit). It was really grim. I hate cycling in strong winds, I’m always convinced I’m going to get knocked off. 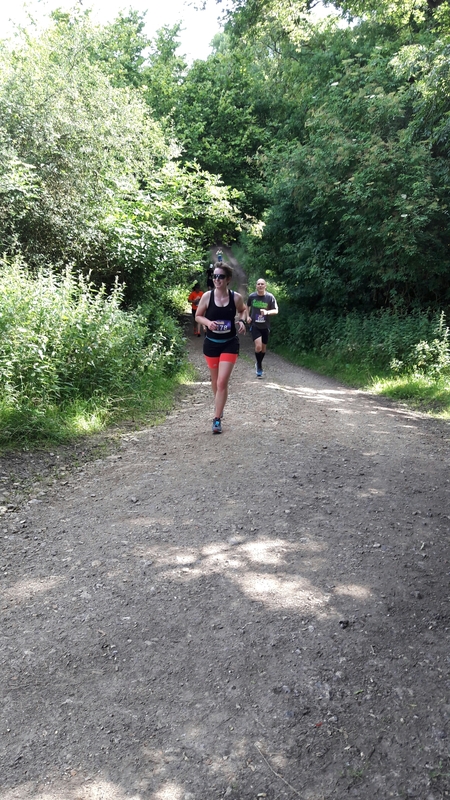 And every time I was overtaken (which was a lot) I lost more confidence and motivation. My legs had no power and while everyone else sped past, hardly affected by the wind, I was locked in a battle, my (slightly too big) mass against the force of the wind. Halfway round the first lap I thought I might not do the second lap, partly because I was worried about not making the time cut off (which is incredibly depressing) and also because I was just not enjoying it. I was eventually lapped at the very end of the first lap, which added an extra layer of depression. But I went on to the second lap. It was slightly better on the second lap but my hands were numb from gripping my handlebars too tightly and I stopped every half hour to shake them out. I managed to eat one peanut butter bar and one gel. Again I took my time. Bike racked, helmet, gloves, jersey off. Tshirt, sunglasses, hat, fuel belt on. Bike shoes off and socks and trainers on. Sitting down, because why not. And then off again. By now it was very warm, although I probably just noticed it more as it was less windy. My legs had felt tired on the bike but when I started running I felt alright; my feet had been sore while cycling but I was surprised that they didn’t really bother me. Could this last? 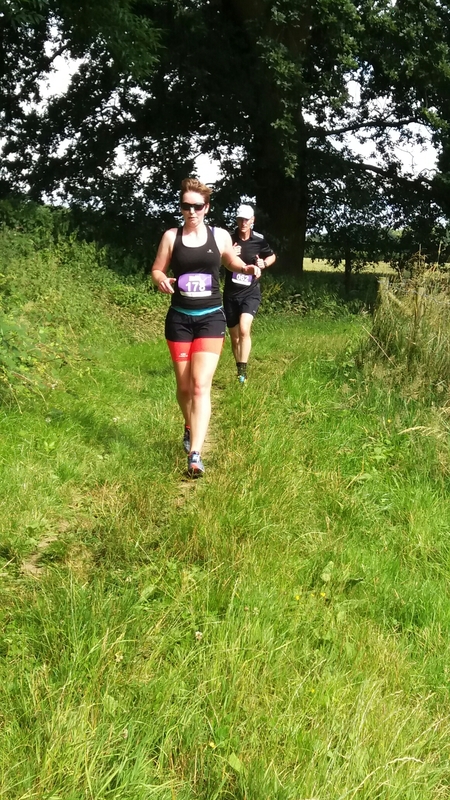 I set off on a meandering route through parks and woods, eventually joining up with the rest of the route, where we would run laps through the town, picking up a wristband at the end of each lap. In my head I heard “four wristbands” and thought I had to run four laps, so I was a bit put out when I finally worked out that actually there were five laps (one without a wristband, four with increasing numbers of wristbands). Gah. 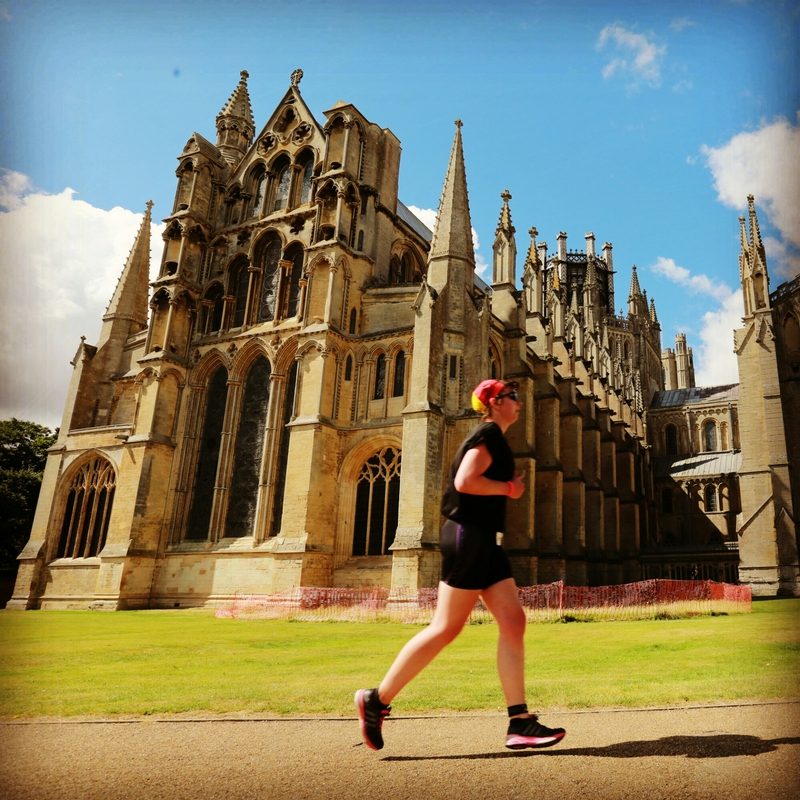 I had a fuel belt with Shotbloks, two gels and a packet of jelly beans but it was bouncy and annoying, so when I saw my mum (she went home after dropping me off, but came back for the run) outside the cathedral I decided to leave it with her. She didn’t spot me running towards her and eventually I yelled out “HELLO!” so loudly that it made some tourists jump. Then I posed for some pictures and went on my way. Although my legs felt alright, I walked up the hills and ran everything else – which meant three walks per lap (one of the hills was probably more of a slope, but these were my rules!!). It was a relief to get my first wristband. The course went past the cathedral twice per lap, which was cool. The people of Ely were all friendly and there were quite a few retired couples who’d stumbled across the race and were enjoying cheering. Lots of confused looking tourists. Ely is very pretty, with the exception of the bit past Sainsbury’s, which still isn’t that bad. I went past my brother’s old school. I waved to my mum on each lap. I petted a small dog (who looked like a teddy bear!). I got in an argument with a lorry driver who nearly ran over me and the guy I was running with. By the fourth lap I was starting to feel tired, it was so hot and there were fewer people still running to chat to. I was drinking lots of water but had only eaten a packet of Shotbloks. At one of the water points I picked up a gel but it was horrible, granular and really thick. Mum drove past me as I ran down the hill towards the start of my final lap and heckled me from the car. Mum thought the run was 4 laps so once she’d parked, she went to the finish. When she didn’t find me there, she thought something must have happened, so got the marshals all looking for me, radioing each other to report on me. Embarrassing – but also quite funny. I broke my rule of only walking uphill on the final lap as I was knackered, my knees and hips ached. I said thanks to all the marshals and as I jogged down the hill in the final kilometre I thought to myself: wow, you’ve gone and done it, you’ve finished a half ironman with no training and barely any food – you total moron. I ran into the park, and turned left to the finish line. At last! My running form was totally pants by this point but I had four wristbands and I was coming for my medal! 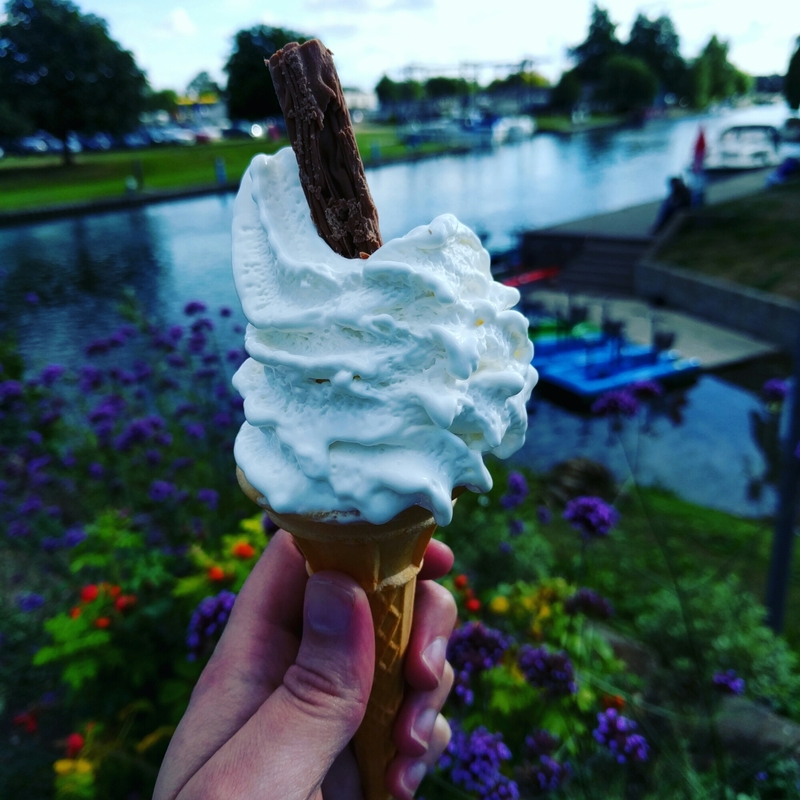 A banana and some water later, I got changed in the carpark toilets and went for lunch with my mum – a massive salad with a heap of bread, followed up by a 99 with a flake. I’m pleased that the swim went better than expected (actually faster than last year, and no panicking!) and I inexplicably ran faster than the last two half marathons I’ve done (Richmond and Ashridge) – I actually felt pretty good on the run, apart from the final 5km and when I thought I might be sick in a bin after eating that gel. But the bike… I’m shocked at how bad I was. As I struggled around, I promised myself that I would cycle more and get my cycling legs back, which I’m determined to do. Matt and I recently went on holiday to Scotland. On Saturday, we got up super early and were at Brixton for the first tube up to Euston. We’d booked first class for the journey up to Glasgow, as it was only £2 more each – well worth it, considering you get much more space, wifi, tea/coffee and snacks. We both did some sleeping, reading and knitting (okay, just me), and ate our breakfast panettone. Just after 11 we pulled into Glasgow Central, ready for our adventure. We went to a nice quirky little cafe and the first soup of the holiday. Then we picked up our car and hit the road! 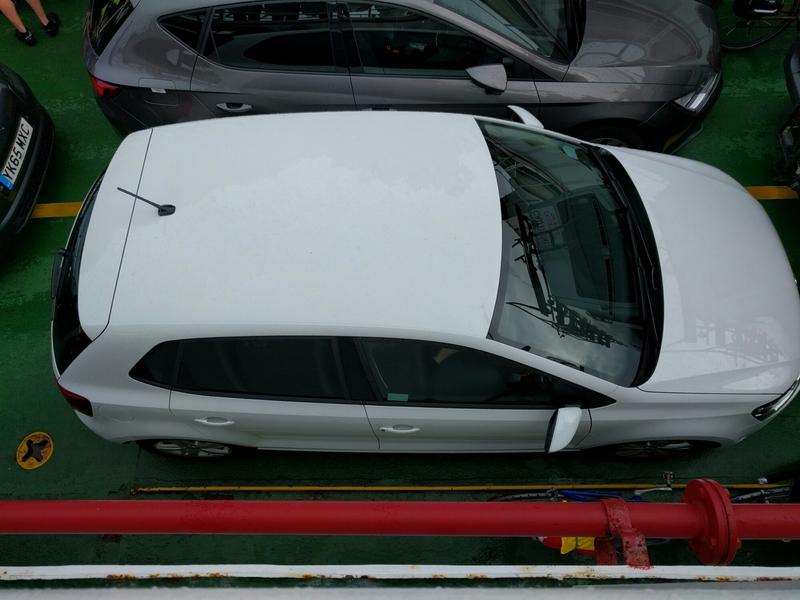 We’d planned to take the ferry from Oban over to Mull, but when I’d tried to book the ferry the day before I’d discovered it was fully booked! 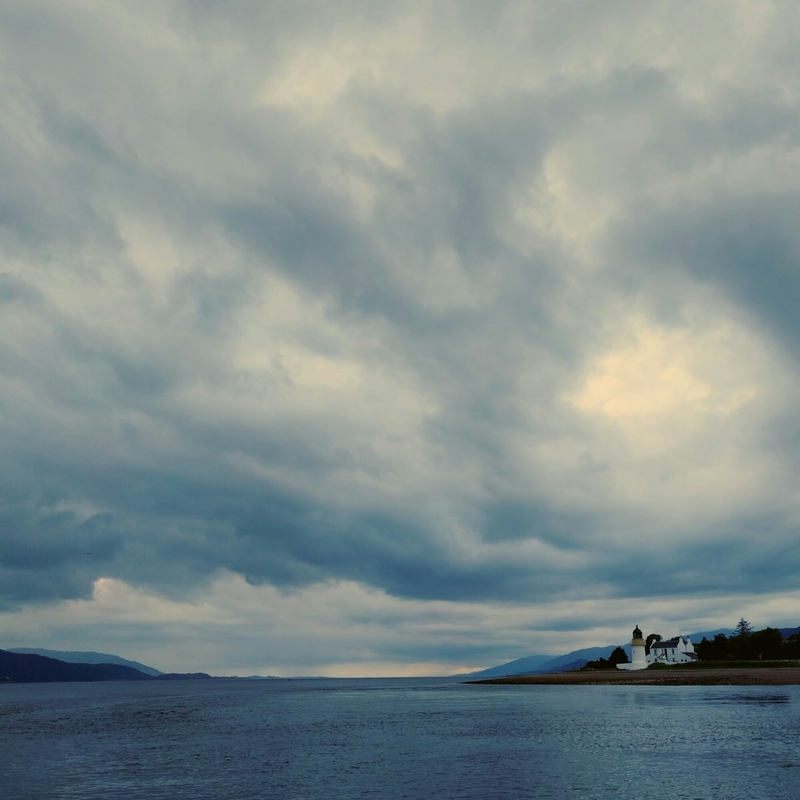 Instead we had to drive to Lochaline, about 100 miles further, and take the ferry from there. It was a long old drive and quite stressful as we had to be at Lochaline for 17.15, and had another ferry to catch before then. It was a relief to get a cup of tea at Lochaline and drink it in the queue, Mull finally in sight. From there it was still a long drive across Mull to Fionnphort, in the west, and I was exhausted. In Fionnphort we had dinner at the pub before going to the campsite. The campsite was on a farm and next to the sea. We pitched in a little hollow (to the disappointment of the people camping about 25m away, who wanted the whole place to themselves) and settled in for the night. The next morning was glorious. We thought we might get up early to take the boat to Staffa, but when my alarm went off early, I turned it off and went back to sleep. We finally emerged into beautiful sunshine – what a day! At Fionnphort there were lots of tourists waiting to take the boat to Staffa, some of whom had arrived by coach. I was glad we were taking the less touristy ferry to Iona! I had a great vibe as soon as we stepped off the ferry – the sunshine helped and it was such a pretty place. 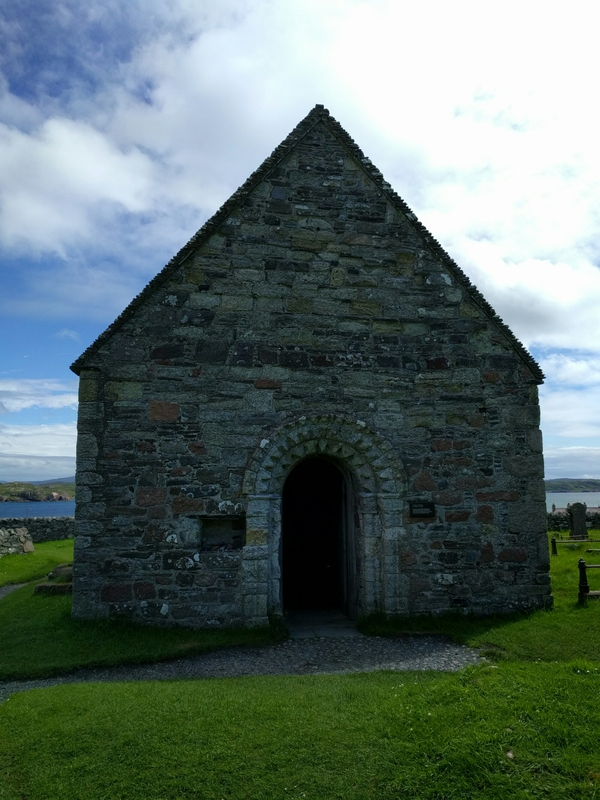 We looked at the old nunnery, then wandered up the monastery and visited the oldest building still standing on Iona. After some soup in the sunshine we set off on a walk across the island, ending up at a beach on the west of the island. With nothing but sea stretching off into the distance, we scanned the horizon for whales. 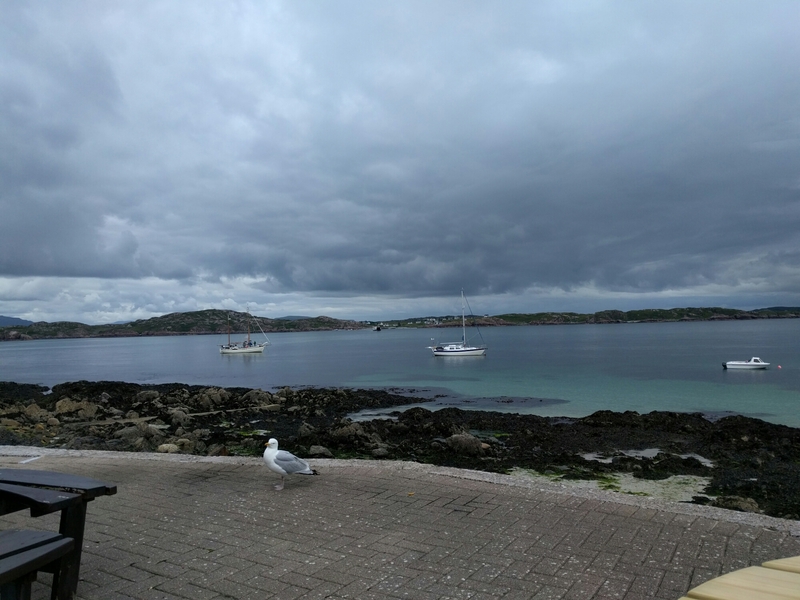 Waiting for the ferry, we enjoyed a cup of tea while a giant seagull tried to stake its territory. We ate at the pub in Fionnphort again, and I ran back to the campsite afterwards. It was a good run, despite a few drivers trying to push me off the road. Matt was waiting in the car when I got back, but I didn’t spot him and went directly to the tent, leaving us both wondering where the other was. The next morning Matt woke up and put his shoe on – to find a frog hiding inside! He was NOT impressed but I found it hilarious. I also found it hilarious that the people in the tent near us who hadn’t wanted us to camp so close to them now had to deal with rap music from the tent on the other side. Ha. 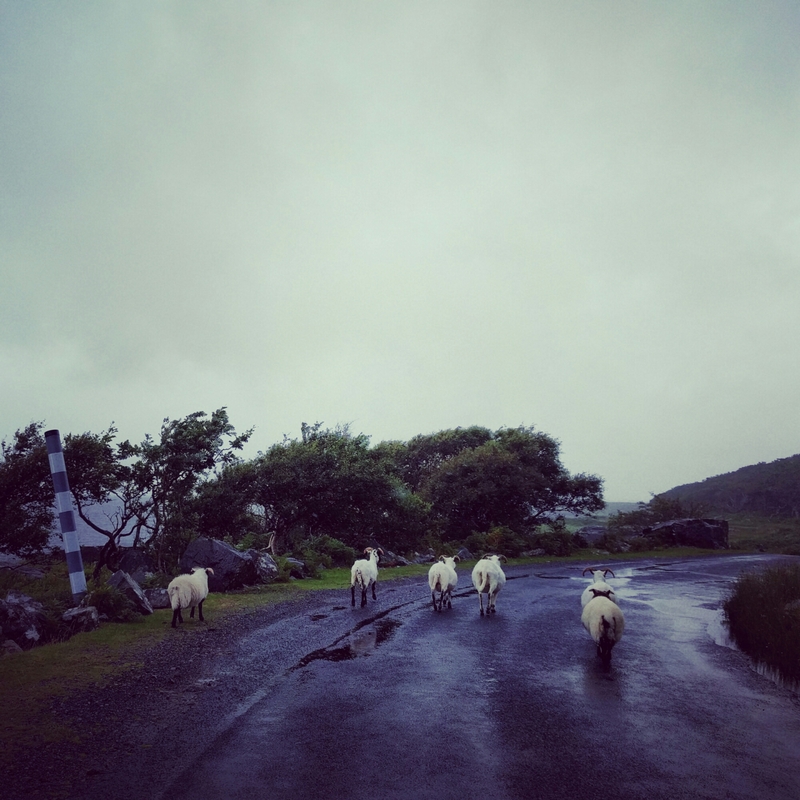 We packed up and set off across Mull, stopping at Loch Frisa to look for sea eagles, as well as briefly stopping whenever a flock of sheep decided to wander in the road. 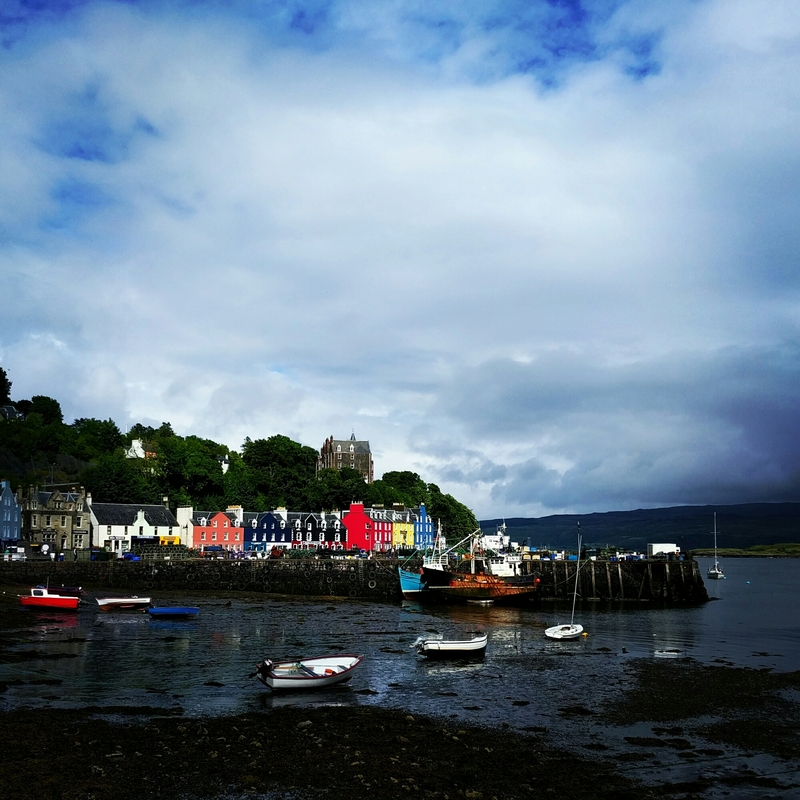 After Loch Frisa, it was a short drive to Tobermory, a ridiculously pretty little town (and setting for the kids TV show Balamory). We ate soup at a jetty side cafe and admired the brightly coloured houses. We were staying in a B&B rather than camping, and were excited to sleep in a bed and have an ensuite shower! Matt was so excited that he had a two hour nap, while I went for a little run around the (extremely hilly) town. We went out for dinner at a restaurant by the distillery, and Matt ate a lot of mussels and sampled the local whisky. We had a ferry to catch at 9.30, which felt like it would be a rush, but we managed to fit in a run (just me), showers, cooked breakfast and a trip to the Co-Op before boarding the ferry. I couldn’t get into the car once it was on board as it was surrounded by bikes, so I stood on the decking and pulled faces at Matt, who ate biscuits quite happily in the car. Back on the mainland we got stuck behind some cyclists wobbling all over the road. They were really struggling not long after leaving the ferry. One guy was gunning it and we didn’t pass him for quite some time. I was extremely jealous of everyone cycling!! We got stuck behind a few selfish drivers – the roads were single track with passing places and it’s safer to let faster cars past, rather than causing a snake of cars, as it’s impossible to use the passing places properly as too many cars try to fit in them at once. Some drivers did not get this, even when we started using indicators to try to force them to pull in. At Mallaig we took the ferry over to Skye, a big ferry this time, where we had to leave the car and go up onto the deck. It smelled of old chips. 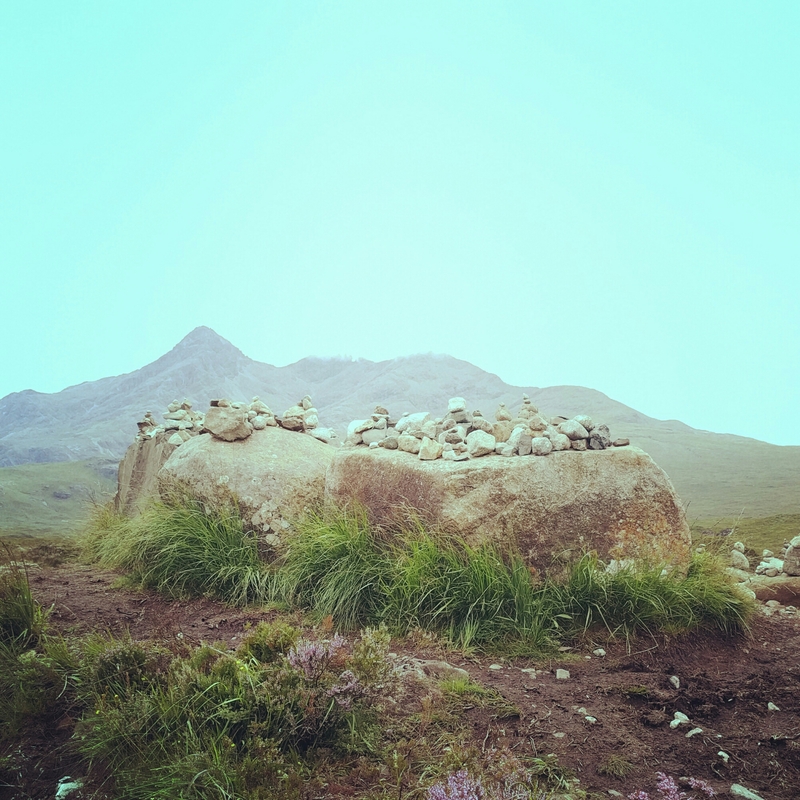 We were tired by the time we got to Skye and I kept my eyes peeled for somewhere to get some soup and a cup of tea. We stopped at a nice looking cafe but they’d sold out of soup, so we got back in the car. Immediately we saw another sign for a cafe, so pulled in there – and what a great decision. The Bread Shed is an offshoot of the Isle of Skye Baking Company, and we had delicious soup with two types of bread. Refreshed, we drove to our campsite at Sligachan. 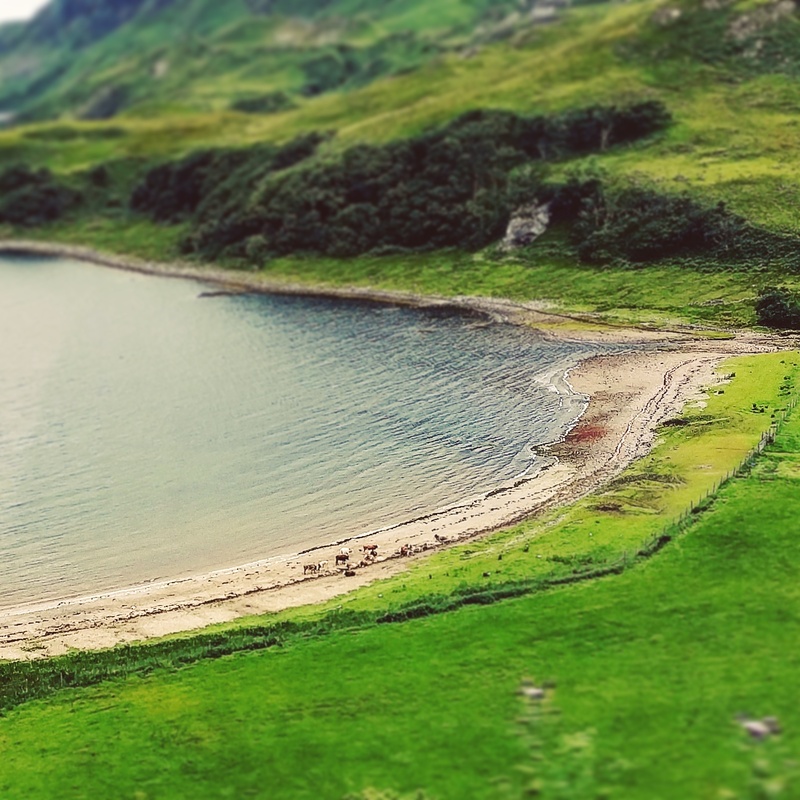 The campsite was at the head of a loch, on what seemed to be a bog. We pitched our tent facing a mountain – a mountain I then found out people had run up and then down in under an hour. 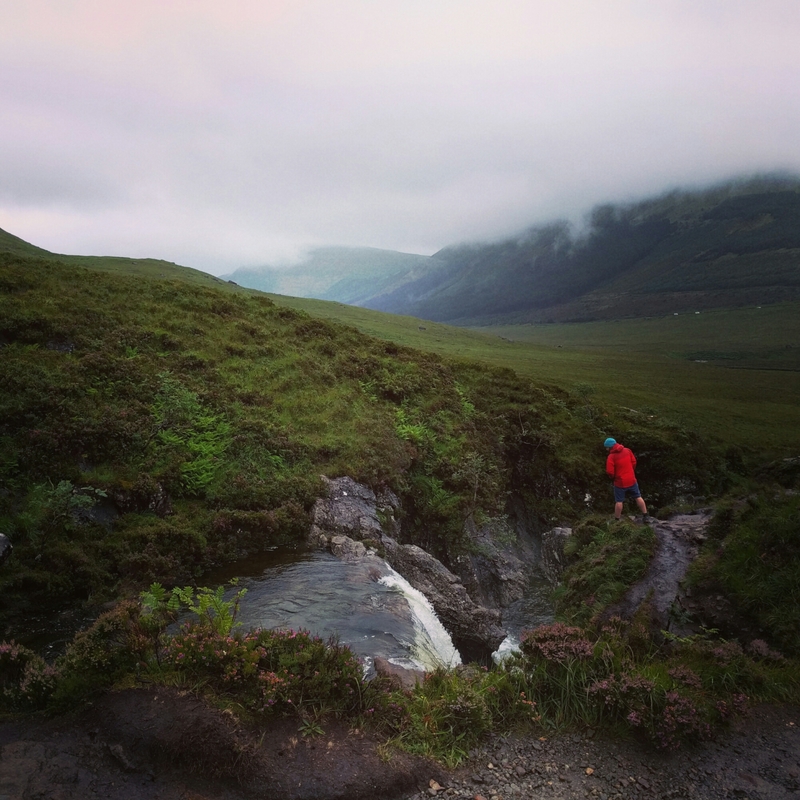 The next day was rainy and grey, and we set off for the Fairy Pools. We needed a cup of tea first and saw a sign to the Wee Tea Room, so decided to follow it. We drove on and on. Just as we were about to turn back, there was another sign, so we carried on. And on. And as we were about to give up, there it was – and we had the best scones of our lives. After popping into Carbost, we went to the Fairy Pools. It was chucking it down on the drive but luckily by the time we ventured out of the car it had cleared a little. The pools were busy but very pretty. No one was swimming. Afterwards we went to Portree for a cup of tea, and ended up at the Isle of Skye Baking Co again for more soup and bread. The evening was spent at the pub in the Sligachan Hotel. That night, we settled into bed. At around 11.30, two cars arrived and a bunch of lads of got out and pitched up. They were incredibly loud, slamming the car doors repeatedly, shouting, having a barbeque inside one of the tents. At around 1 I got up to go to the loo and shone my torch directly at them, thinking they might realise how close they were to other tents, but they didn’t notice. I didn’t really want to go over as there were around 8 of them, all pretty drunk by now. They didn’t seem to have any spacial awareness – none of the group were trying to keep the noise down (as far as I could tell, as they weren’t speaking English). It went on until 3.30am when finally, FINALLY, they went to sleep. I was fuming. The next morning I felt broken, I’d had so little sleep and I was so cross with those boys. I opened and slammed the car boot several times and loudly called them pricks, but they were snoring their heads off. Matt and I set off for a walk, heading to Marsco, one of the mountains in the Red Cuillins. Matt had wanted to tackle one of the Black Cuillins but the weather looked too changeable for that. 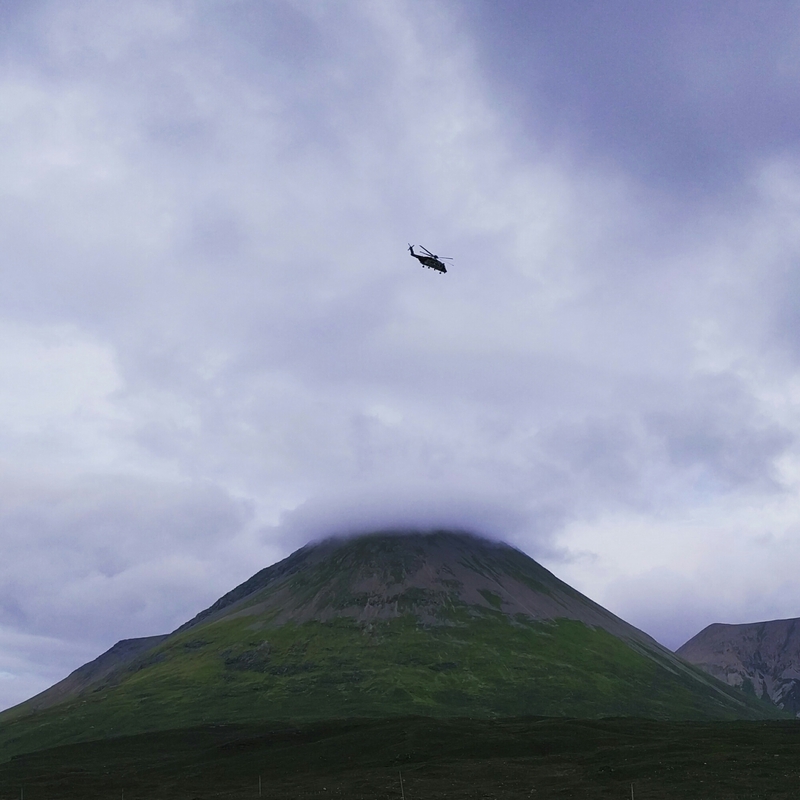 We walked down the Sligachan glen, and were shocked out of our skins when a fighter jet passed on our right, darting out from between the Black Cuillins range. Incredible sight. We walked away from the glen and up towards Marsco, along a boggy path up the side of a burn. It wasn’t particularly enjoyable and I was so tired. Marsco never seemed to get any closer, and after a couple of hours I decided I didn’t want to go on any further. The summit was still some way away and our guide book warned that the summit wasn’t pleasant or easy to walk along. 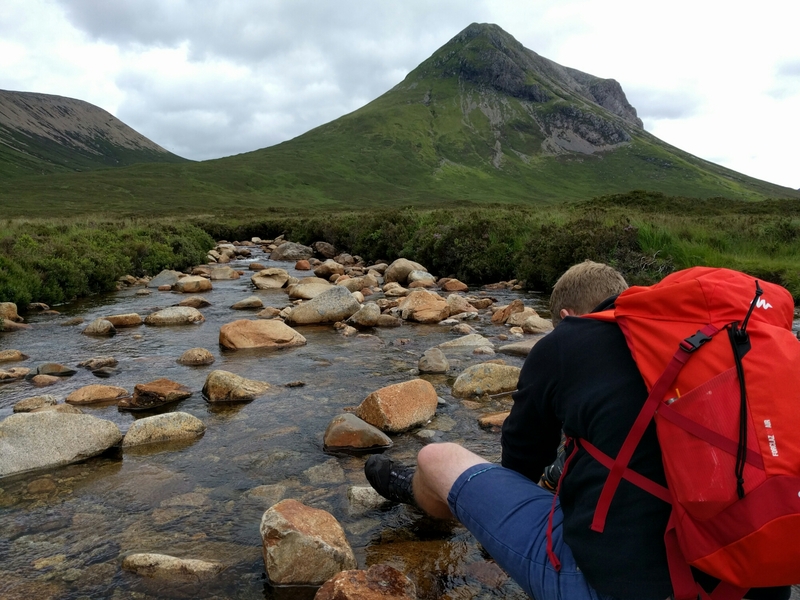 We thought about alternate routes back but in the end retraced our steps back to Sligachan, where we had a cup of tea at the hotel and went back to the tent for a restorative nap – the noisy guys from the night before having thankfully left. I looked over to the campsite entrance and sure enough, the two cars of guys had pulled in. After a little while, one car drove off while the other started driving slowly around the campsite, clearly looking for somewhere to pitch up for the night. They came towards us and we stood up, ready to guard the ground around us. As they turned towards the space near us I walked over to them. “No way. No. You’re not camping here. You’re completely outrageous” I said, remembering how noisy they’d been. They asked if we could hear them last night. I told them they’d kept us up all night. Matt pointed out that one of them, sitting in the front, looked wrecked from the night before. He looked sheepish. They asked why we didn’t tell them to quieten down and I told them that they were intimidating and drunk, and that they shouldn’t camp near any other human beings – or possibly only deaf ones. They took great offence and told me I was rude. “You can’t just tell us we can’t camp here when you’re so rude! If you asked nicely then we would listen!” one of them said. “Okay, please do not not camp here” I said. “Erm… okay…” they said, and drove off, back to the campsite office, where after dithering for a minute they asked for a refund and left the campsite. When we spoke to the campsite owner later he seemed annoyed that he hadn’t been able to get involved in an argument the night before but didn’t seem bothered that I’d just kicked people out of his campsite. 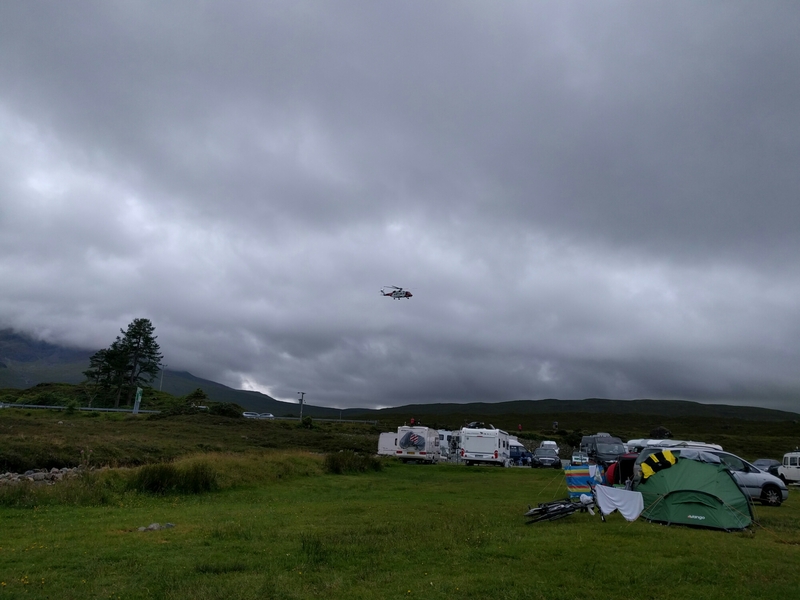 That evening we watched the Mountain Rescue helicopter take off and land, went to a gig at the Sligachan Hotel and watched two border collies playing – one with four legs and one with three legs – and then had a lovely quiet night’s sleep. 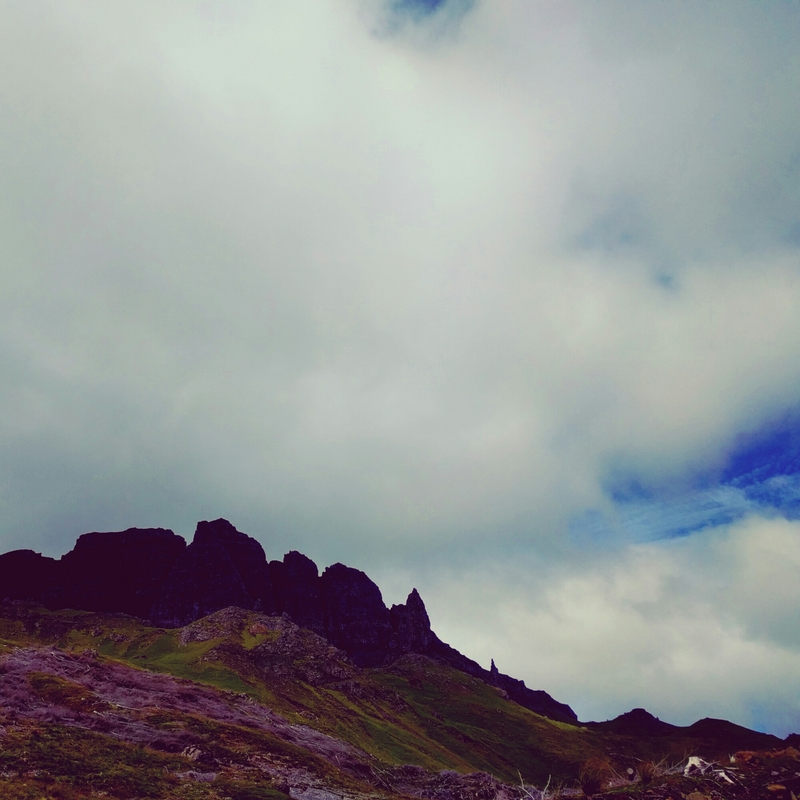 In the morning we packed up our tent and drove up to Portree, where once again we went to the Isle of Skye Baking Co, before walking up the Old Man of Storr. There was a man flying a drone, which Matt was happy about, and a man with two labrador puppies, which made my day. 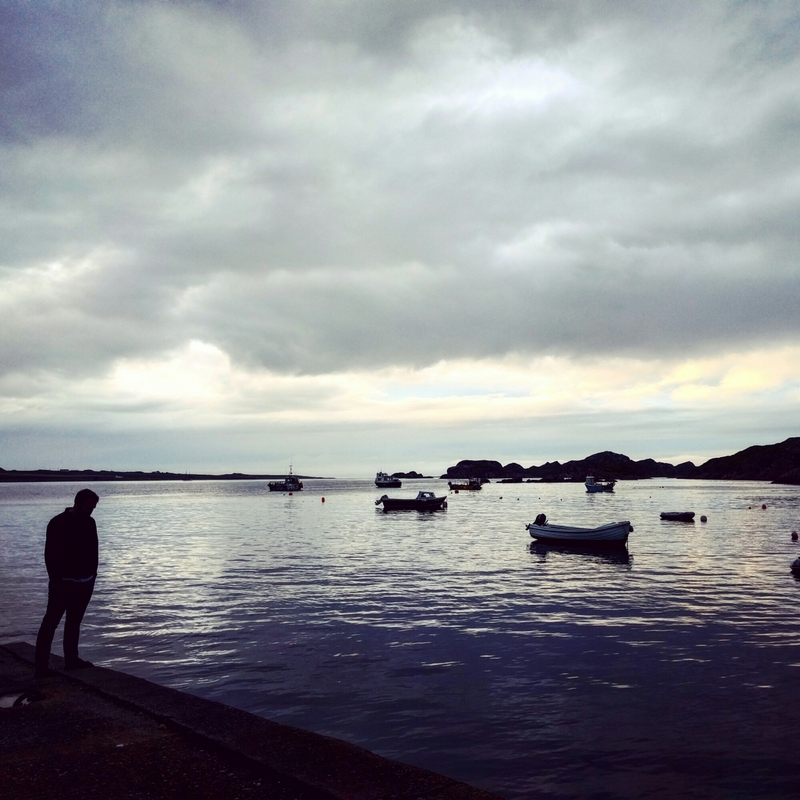 We set off back for the mainland, and I told Matt of my plan to run across the Skye bridge. The bridge was built a few years ago and used to have a toll, but so many people refused to pay that it got dropped. Unfortunately there was nowhere to pull in before the bridge and we were on it before we knew, so on the mainland side we stopped at a Co-Op and I got changed into running kit and ran back over to Skye, with Matt following in the car (luckily no heckling when he passed me!). On the other side he picked me up and drove back over the bridge AGAIN (definitely glad there’s no toll) and we had lunch looking over the water to Skye, with some otters keeping an eye on us. It was a long drive from here, with no fixed destination – we hadn’t booked anywhere to stay, thinking that we might stay in Glencoe. We listened to Radio 2 drivetime and sang/danced along. We stopped for a cup of tea in Glencoe but decided to carry on. 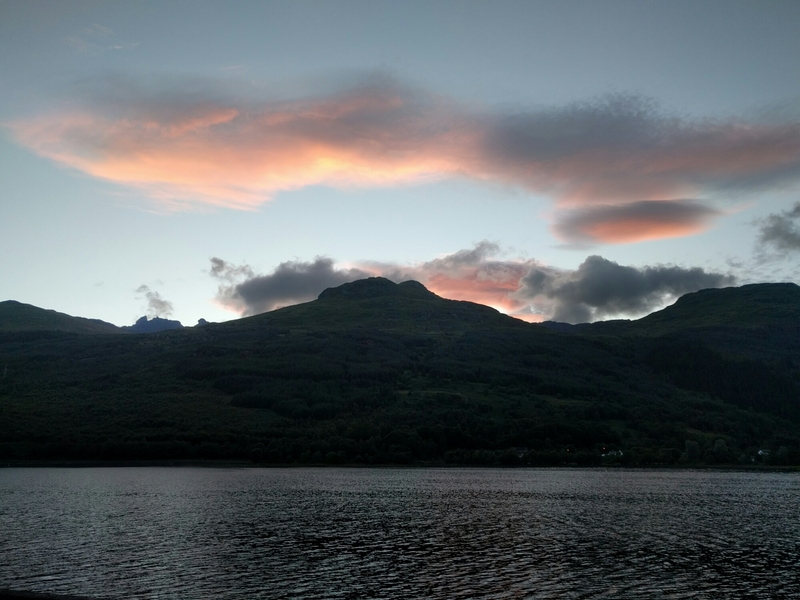 After having our hopes dashed by a sign promising hot tub cabins “available tonight” (they weren’t), we wound up staying in Arrochar, at the top of Loch Long. 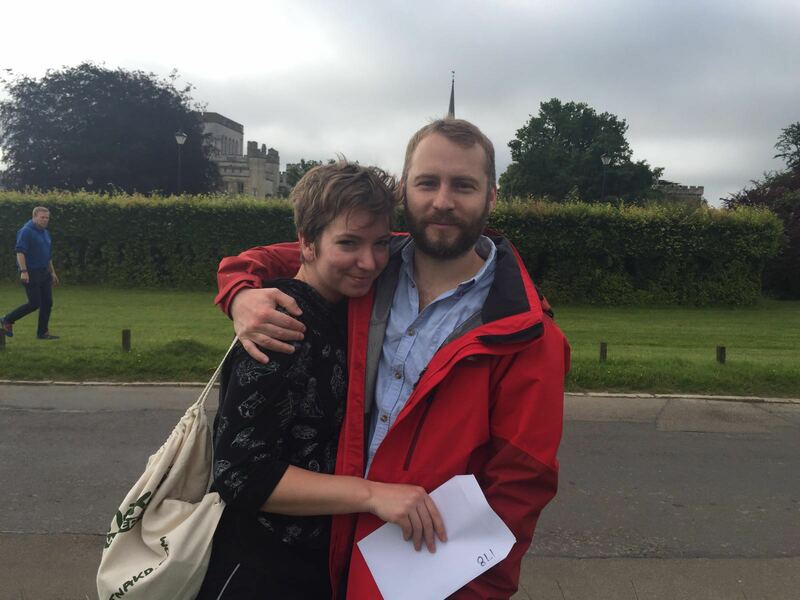 We’d had our eyes open for B&Bs with a sign proclaiming “vacancies” and one did, so in we went. The host was a retired chap, dog sitting his daughter’s labradoodle for the weekend and enjoying his wife being away with a sneaky mid-afternoon trip to the pub, and he had two rooms available. We chose the one with the loch view, then went to the pub ourselves! The final morning heralded a great breakfast (including porridge), cooked by our host who asked us how we’d voted in Brexit. We drove down to Glasgow, where we got caught in some traffic and had a terrible time trying to find a petrol station in the city (spoiler alert: Glasgow doesn’t have many petrol stations) in order to return the car with a full tank. 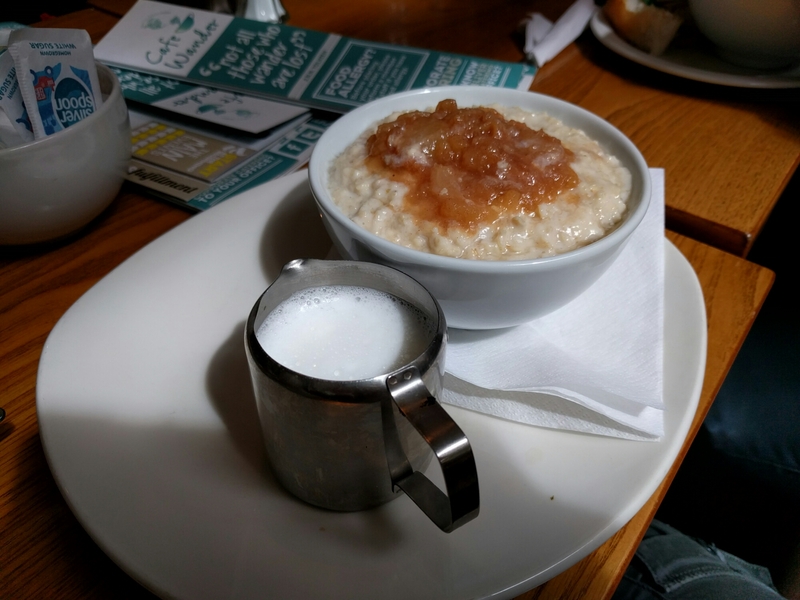 We’d thought we might go and do something cultural in Glasgow before getting the train, but our bags were really heavy, so we went back to Cafe Wander and I had my second bowl of porridge of the day. 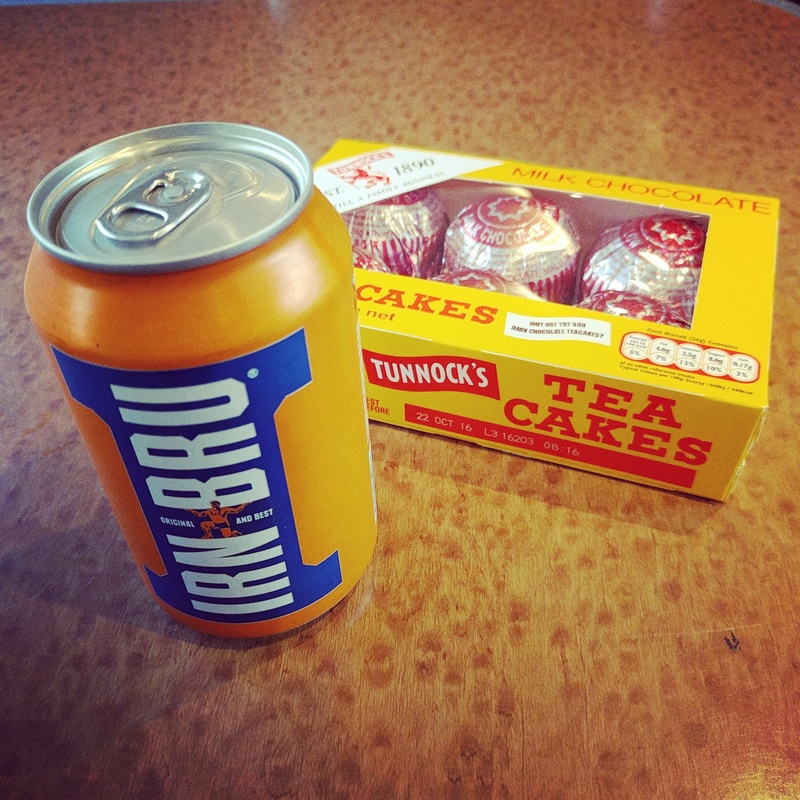 The train back was long but passed by quickly thanks to a box of teacakes and the train conductor holding a quiz over the tannoy. We had friends staying for the weekend who were already at our house when we got back – the perfect end to a holiday, and nice to hang out with some of my favourite people! 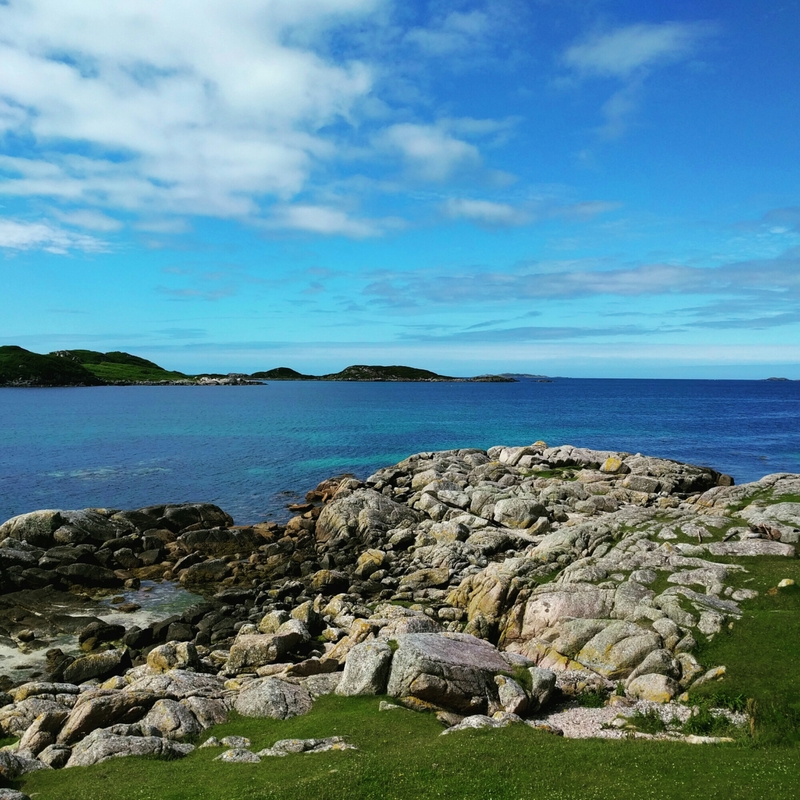 If I was to plan the same holiday again I would spend less time in the car (we drove around 650 miles, which was quite tiring (although it only cost £60 in petrol! 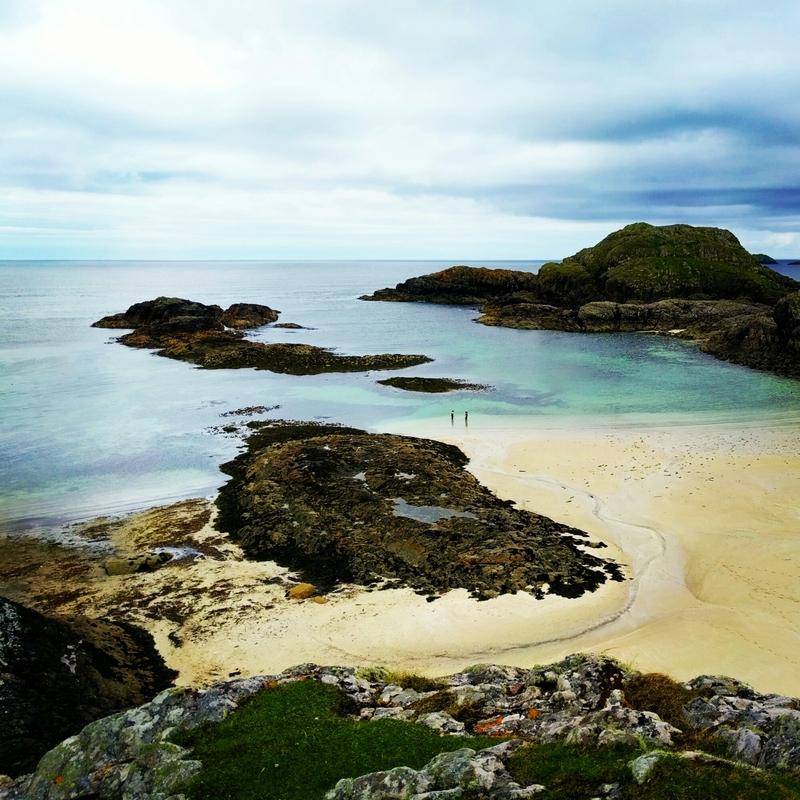 )); I would encourage Matt to pack his own thermals so he didn’t steal my leggings to sleep in; I would probably spend more time on Mull and in Tobermory; I would go to the Wee Tea Room again; and I would eat even more soup. I saw that there was a trail half marathon in the forest near where my best friend and her husband live. They were home that weekend and invited Matt and I to stay, so I entered. The night before the race we ate delicious pearl barley risotto, followed by sticky toffee pudding and icecream. Perfect race prep! Lots of great chats later, we headed to bed about midnight, after booking a cab for the morning. I laid out my running clothes and went to brush my teeth, only to return and find that drunken Matt had decided to hide all my clothes in the bed. Thanks, dear. I felt mean making everyone get up so early on a weekend, but being the lovely people that they are, they claimed not to mind. We piled into the taxi a few minutes late, to a telling off from the driver, then drove in silence to the Ashridge Forest. It’s not far but the route by car isn’t very direct, so it feels further away than it really is. 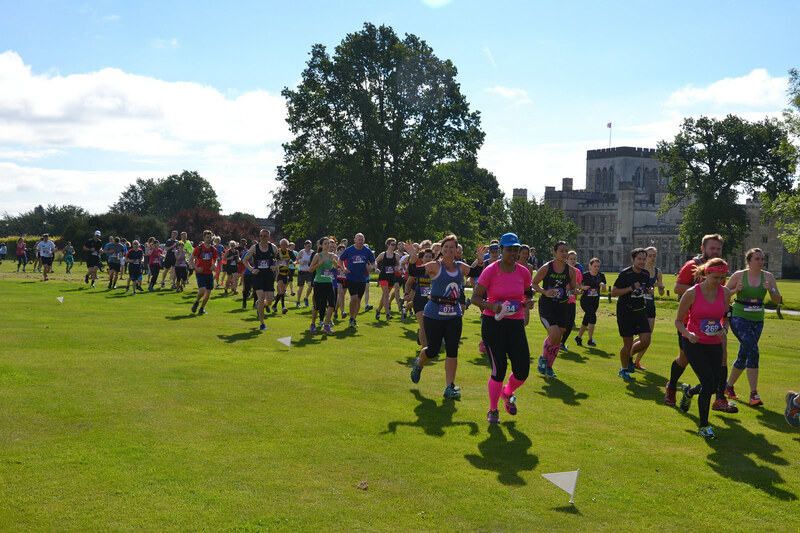 We pulled up at an inflatable arch on the grass outside Ashridge College – I love a low key race! It was quite chilly but was clearly going to be a nice day. The race was due to start a few minutes late as there were lots of people still registering so we stood about admiring dogs and I put on sunblock (although I was the only one of us to do so!). At about 9.10, there was a countdown and we were off! I gave the others a wave – they were planning to walk to Bridgewater Monument and have brunch there, and I’d pass them about 9km in. We headed into the woods, running on rutted paths. The glare from the sun through the leaves made it a little difficult to see, and I was running quite close to other people, which I didn’t love. A man in front tripped but caught himself. I was feeling comfortable but decided to walk up the first hill as everyone around me did, a wise decision as it conserved some energy. I saw a lady taking photos at the top of the hill so ran again for the camera, but really shouldn’t have! At about 5km there was a sign saying drinks ahead, but they’d run out of water! I was unimpressed but didn’t say anything, after all, it’s not the volunteers fault. But I felt grotty as I trudged across a field in the sunshine, the long grass making me pick my feet up high. We went back into the woods and I perked up a little, power walking up the hills and jogging the rest of the way. Some runners ahead of me headed into the woods and I couldn’t work out if the leader just needed the loo and the others were following. I stayed on the main path and chatted to some horse riders, who asked what was going on. As we came to Bridgewater Monument there was a killer steep hill. Everyone around me walked up this and I managed to jog the last bit, up over the crest and into the clearing, where I saw Matt, Lou and Ant up ahead. I ran over to them and asked for some water – they told me I was covered in flies and we had a brief chat. I was jealous of them sitting at the cafe, but I was really enjoying myself so headed on. From here we followed a path I’ve walked before. The views out to the east were brilliant although I’m sure the path was steeper than before… My garmin ticked over to 11k and I still felt pretty good. I’m not very confident running downhill but decided to relax a bit more going down a limestone path, not too rocky and not too many other people around. Sure enough I tripped over a small tree stump and went straight down, landing on my knees and my hand. I jumped up quickly and looked down at myself. 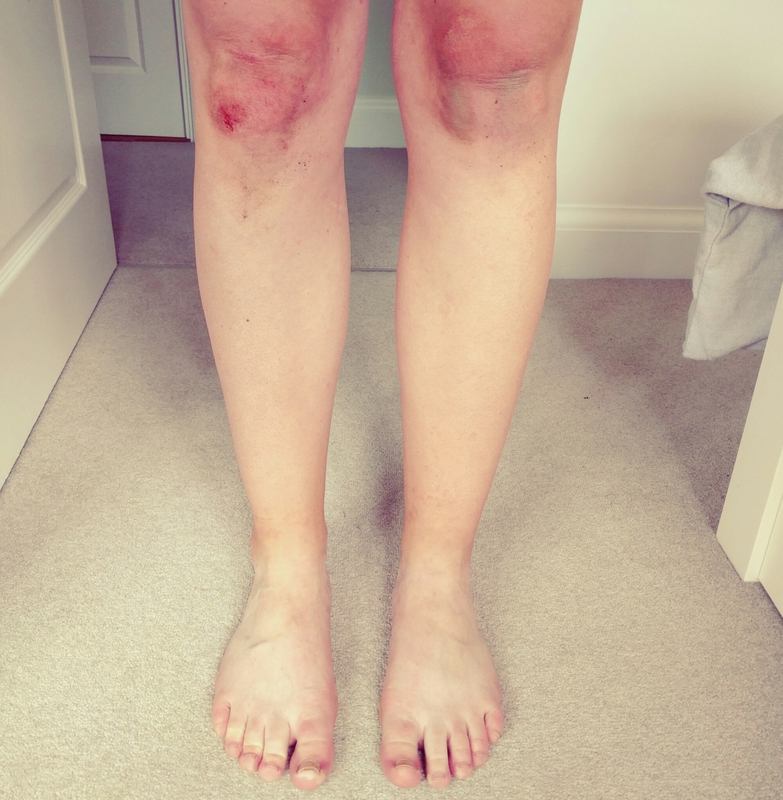 My knees were skinned but there didn’t seem to be anything stuck in them, so I carried on, tentatively. It didn’t hurt too much at first but it wasn’t very comfortable. We headed over a field and took a right, up an enormous hill called Steps Hill. It stretched up and curved round to the left into the clouds. I ran to the first little shrubbery and then walked the rest of the way up, looking at the incredible views and still, bizarrely, feeling okay (though with quite sore knees). At the top, the path went through some ferns (I love the smell of ferns) and to another water stop. Hooray for water! There were a couple of rollers, the steepest rollers I’ve ever run, and a man being towed by his dog breezed past. Finally at the top of Ivinghoe Beacon, I stopped to admire the view. It really was lovely. There were lots of walkers and I asked someone which direction was north, so that I could get my bearings. I set off along the top of the ridge, looking at the view and becoming aware that I did quite need the loo. As we came down the ridge there were some woods on the edge of a field, so I took a detour for a loo stop – though ended up going further into the woods than expected as the man being towed by his dog inexplicably came past in the opposite direction. A little lighter, I emerged from the woods and rejoined the path. There were a group of four runners in yellow club vests coming down the hill and I wanted to stay ahead of them for the sole reason that we’d clocked one of them before the race, a man with an incredibly hairy back, and Matt had said that I would finish just behind him, breathing in a mouth full of back hair. I did not want to do this. Soon I was back in the woods. The route didn’t seem very well marked and I wondered if I was going the right way, but I was running with another girl, taking it in turns to struggle with gates. I finally knew we were on the right track as we came to a set of stairs. Stairs in the woods. Just over 10 miles in. Think about it. I hauled myself up the stairs, very very slowly. There were nettles growing next to the handrail so I didn’t want to use that, and these bloody stairs just went on and on. At the top, my tired little legs battled through a farm, where someone asked if anyone knew how to ride a cow, and three enormous geese eyed us up. “Oh do shut up, Gary” she replied. Matt, Lou and Ant had said they might try to come to the golf course to cheer me on there, but after crossing one road (where there was a water stop, hooray!) and then another (where a man had a bowl of jelly babies) I found myself running alongside the edge of the golf course. By now I was pretty tired and even though I had less than 2km to go, I couldn’t convince myself go any faster. It didn’t help that I was on my own, having lost my friends in purple, and that there were no signs showing where to go. I stopped at a crossroads until a dog walker pointed out the way to go. I really didn’t want to get lost, I couldn’t face running a step further than I had to. I could hear the yellow-vested running club behind me and that gave me the impetus to get going. I came out of the woods and onto a road, and a marshal told me to turn right. “Onto the path?” I asked, pointing at the path running to the left of the road. She pointed enigmatically. “Should I run on the road?” I asked. She carried on pointing. I headed for the path. “Run on the road!” she shouted. Argh. I trudged up the road, thinking that it must nearly be the end but why couldn’t I see Ashridge House? The road headed uphill and all the cars coming down looked really pissed off about runners in the road. The road surface was terrible and I concentrated hard to make sure I didn’t trip. 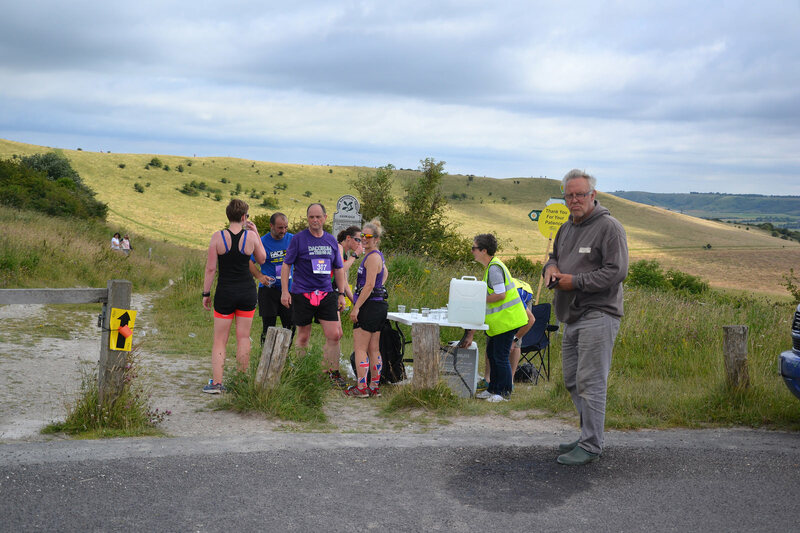 At the top of the hill – which probably wasn’t really that big – marshals beckoned me onto the grass, and up another hill, over which I could just about make out the top of the inflatable arch marking the finish. Matt was sitting on the grass to the left and I gave him a tired wave, before the final kick uphill sucked the life out of my legs. With a few hundred metres to go I picked up my feet and headed for the finish, not wanting to check how close the yellow vests were. Lou and Ant were near the finish line and I got loads of claps and cheers as I ran across the grass and finally over the line (beating the yellow vests, phew). It was nice to have people to hang out with after the race, and we sat in the sunshine for a while cheering other runners. One lady finished with her dog, and then came and stood near us. I caught the dog’s eye and she came running over for a cuddle, plonking herself down next to me and leaning in for a snuggle. Best race finish ever! Afterwards we went home and drank tea in the sunshine, before going to the pub for dinner. A successful Saturday! Although I was slow, this race had the biggest amount of elevation I’ve covered in one run, so I don’t mind. I had a lot of fun and it was really enjoyable. And I by no means came last, 7 out of 14 in my age group.